What Noise Does a Rabbit Make? by Carrie Weston: Rabbit seeks to find what sound rabbits make, but learns sometimes it’s nice to not make much noise! Duck! Rabbit! by Amy Krouse Rosenthal: A fun and humorous approach to the optical illusion– some of the kids saw a duck first and some saw a rabbit first! Too Many Carrots by Katy Hudson: Rabbit collects carrots until he doesn’t have any room left in his home. His friends each offer him a home, but rabbit’s carrot collection continues to ruin things and he has to learn some life lessons. Guess How Much I Love You by Sam McBratney: A sweet classic about a father rabbit and little rabbit sharing their expressions of love. Rabbit themed pre-writing sheets and maze. Made bunny ears for each kid (I had precut the pieces, they glued the pieces together, and then I fitted them their heads). They hopped around on their own for a little bit and then we played a number hop game where they rolled the dice and had to hop the number of times shown on the dice. Color hop where they had to hop to the color I said. Carrots and Ranch dressing– because rabbits love carrots and Ranch starts with R! We always sing the alphabet song, read Chicka Chicka Boom Boom, and add the letter to our coconut tree. I usually do two lessons for each letter, but only share one outline on here for the sake of time. 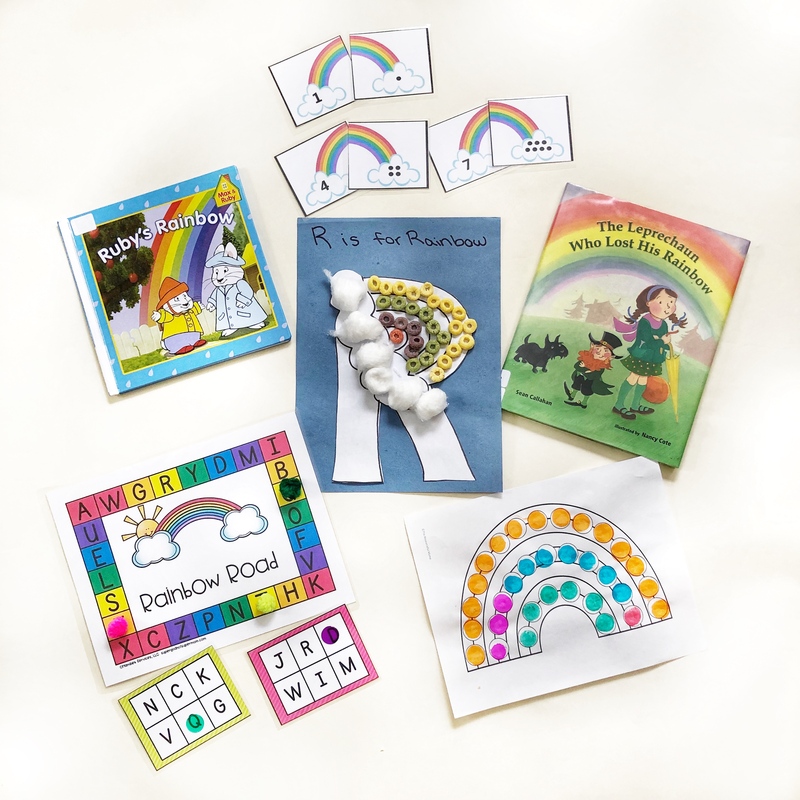 The other lesson we did this week was R is for Rainbow. Last year our rainbow lesson fell close to St. Patrick’s Day so my lesson was based heavily around the holiday. You can check that post out, see the picture below of this year’s non-holiday lesson, and feel free to ask for any links or more information!